A. 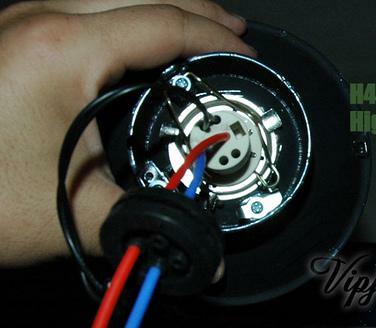 HID kit installations start with preparation. You have to make sure the vehicle is off the battery is disconnected, and the engine is cooled down. This is will ensure your safety. Now we can move to the actual installation. If you have a single low beam kit, locate your low beam dust cover on the back of your headlight assembly. Remove the cover by twisting it counter clock wise. This should unscrew the dust cover giving you access to the bulb. 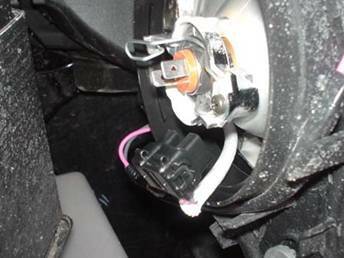 Make sure you unplug the bulb from the wiring harness before you attempt to remove it. Now you can continue to place the xenon bulb in place of the halogen bulb you just removed, just make sure you don’t touch the glass part of the bulb. B.: Installing the ballast. First thing is to find a good location to place the ballast, somewhere close enough to able to reach the bulb with the wiring plugs. Once you have the ballast secured then you can proceed to plug the wiring to the bulb, and plug the old harness to the ballast. 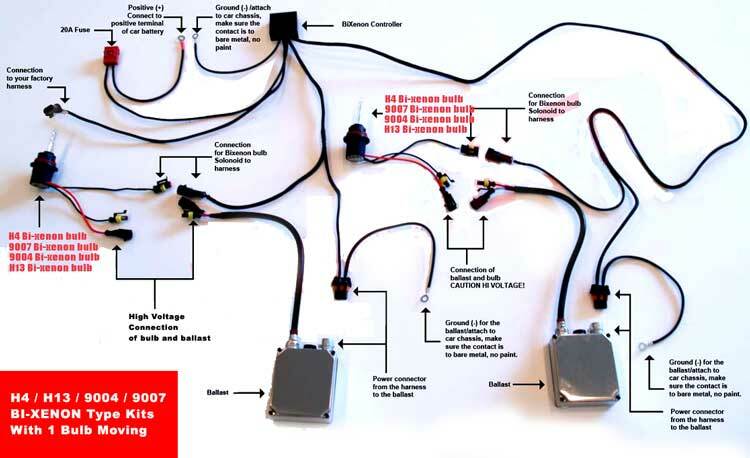 C.: In HID kit installation is to double check all the wiring plugs to make sure everything snapped into place correctly. 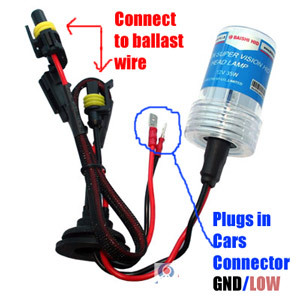 Also double check to make sure that the ballast is securely attached to the vehicle. Now you can reconnect your battery and test out your new HID upgrade. Watch the below installation video done on a Jeep. Your vehicle will be similar: Please note the procedure does not require you to remove the front bumper on most vehicles, as the ballast can be installed right behind the headlight aread on an existing bolt. Some vehicles may require the headlight to move removed because of tight space behind the headlight. Usually 90% of vehicles you can install an HID kit within 30 minutes. My Kit Installed doesn’t turn on! Sometimes the connector you insert into the ballast must be reversed!. 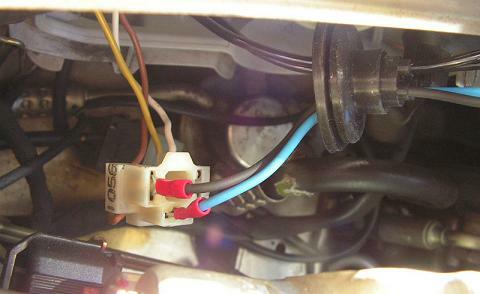 Some cars wiring is reverse polarity, so you may need to switch the polarity and that fixes the problem 99% of the time. 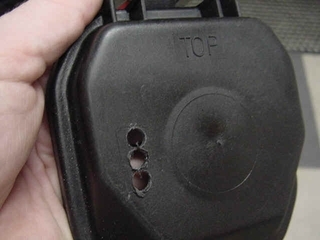 Some vehicles simply require problem eliminators to solve “not turning on” or “Flickering effect”. Solution: a: Start car with headlights turned off. What do I do with the rubber grommet pre-installed on the wires? If your halogen high beam turns on for your low beam on 9007. 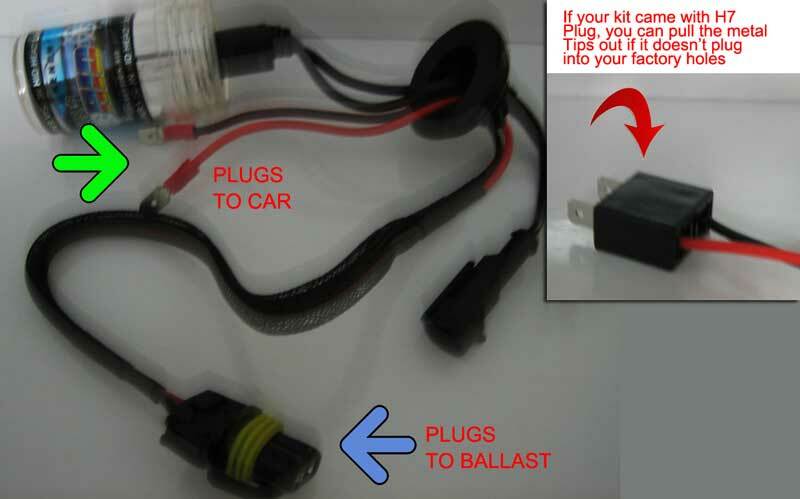 Or if on your 9004 vehicle your lights seem to be acting wrong: This is a common problem associated with polarity from the HID kits connector. 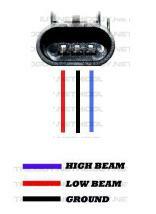 Each vehicle manufactures uses a different configuration for (Ground / Low Beam / High Beam). You can easily swap the pins on the hid connector. Here is how you do it. 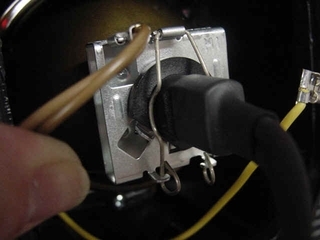 Stick your finger inside the plug where the pins are and bend them down toward the CURVED surface of the plug. Then raise them up a bit and pull from the back. This is the easiest way to swap the pins. Please look at the procedure below in installing an HID kit on various bulb types. 2. Installation the replacement HID H1 bulb without damaging it or touching the glass with your fingers. 3. 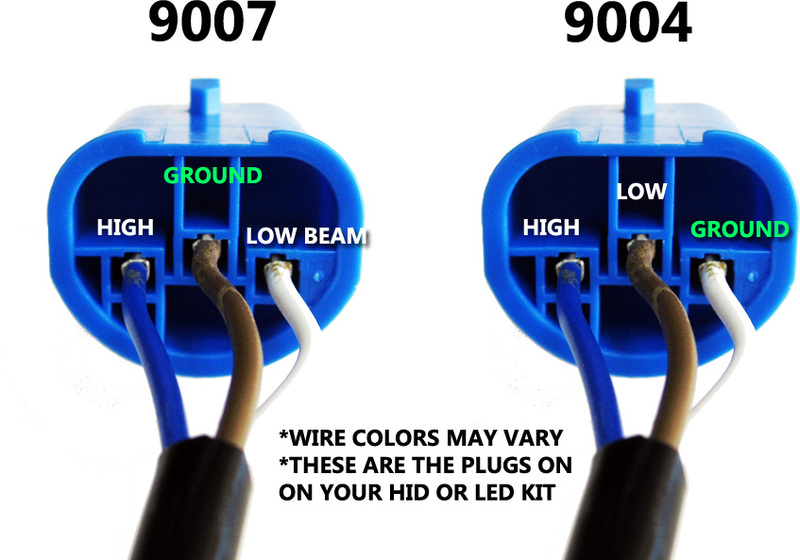 Attach the yellow and brown wires shown in our pictures to the HID kit wire supplied. 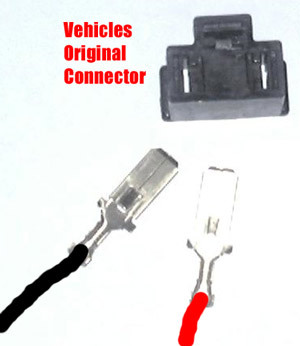 The HID kit wires are males and the original cars connectors (usually yellow/brown) are females.. You are getting power from these exisiting Drill holes for the wire of the bulb to be ran outside if your headlight had a cover. Run the wires through the new holes you drilled and use the supplied rubber garmet if neccessary. 4. Connect the wires from the bulb and from the cars original wiring to the ballast. Mount the ballast in a sercure location by either zip-tie, double back tape, or screw. 1. 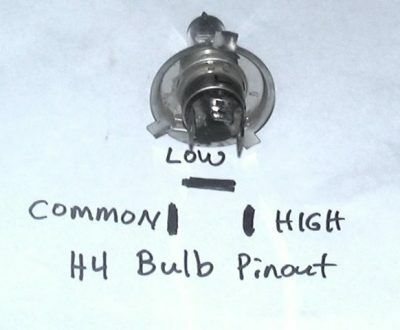 Get access to your bulb by removing parts or covers. Each car is different, please consult your owners manual for getting access to the bulb. 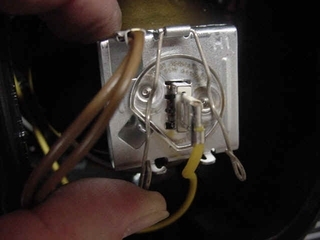 Disconnect the original vehicle’s connector that is attached to the bulb and carefully REMOVE the bulb. 3. 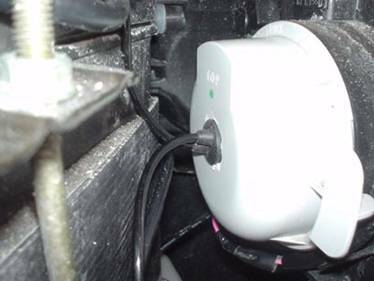 Mount your ballast in a secure place and make sure the connections are tight. You can use zip-tie, double back tape or screws. 1. 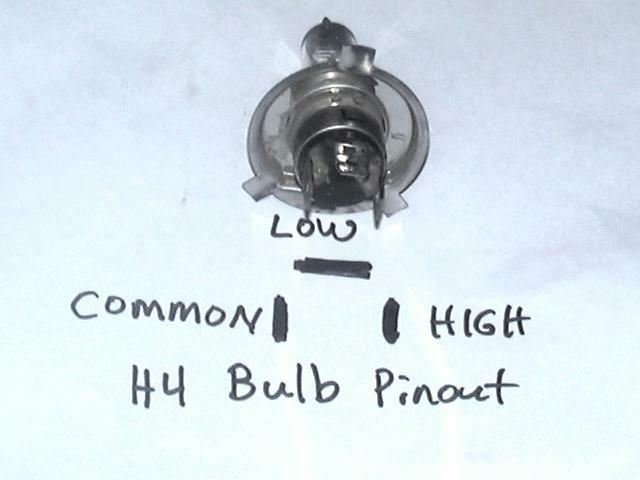 Get access behind the headlight or remove your headlight and remove the H4 bulb as shown below. Install the HID bulb supplied without touching the glass. If you do you must remove with alcohol. 2. Mount the ballast in a good location. 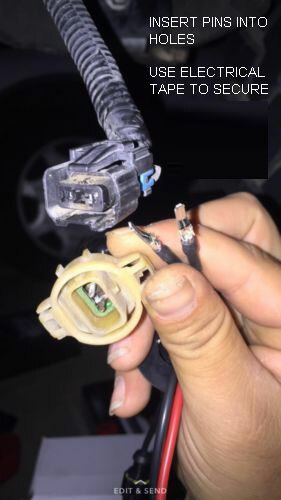 Run any wires through any covers, if any, of your headlights. Connect the bulb wires labeled above to the ballast wires. 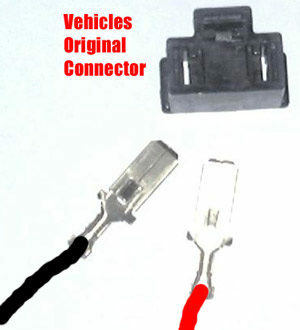 Connect the dangling red/black wires to your cars appropiate terminal, as shown above. 4. 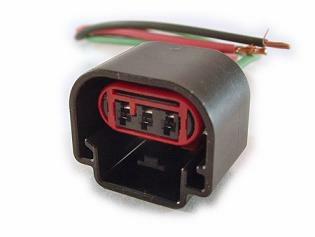 Ballast has two connectectors, positive and negative, connect these into your stock H13 connector. Stick the terminals from the ballast into your original connector above. 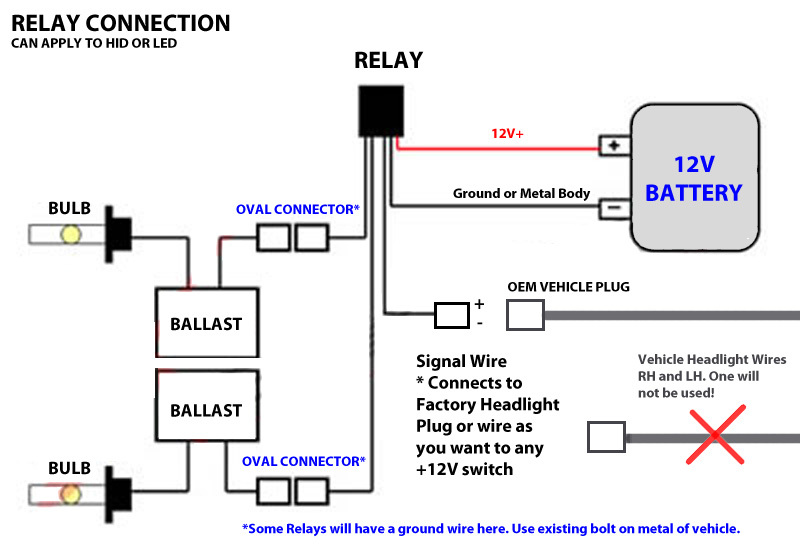 If you purchased our relay harness, the below diagram shows the basic hookup. 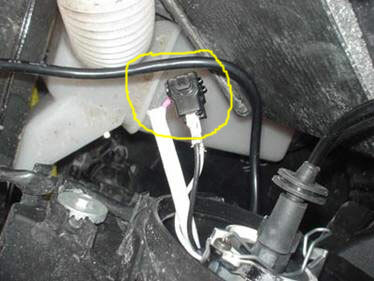 As you can see the relay gets the power from the battery and uses 1 side of the cars bulb connector. The other side factory bulb connector will not be used for anything. Since these type of dual beam kits we offer include a halogen high beam bulb, installing a relay on these kits requires you to wire the high beam halogen, otherwise it will not work. This is very easily done. Most vehicles outside the USA (All of Canada) have daytime running lights. Its important to know where your daytime running lights are running from. If you install an HID kit on #2 with 50% power level your HID will not operate correctly and cause flickering. We recommend if you can, disable your daytime running lights if they are on the bulb your going to convert to HID. You may need to install our standard relay if disabling is not an option and you have flashing problems. 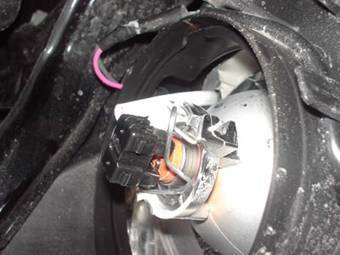 Some vehicles may experience noise in their radio when installing aftermarket HID lighting with ballasts.